On October 2, 1996, at age 25, Armstrong was diagnosed with stage three testicular cancer. The cancer had spread to his lungs, abdomen and brain. On that first visit to a urologist in Austin, Texas, for his cancer symptoms he was already coughing up blood and had a large, painful testicular tumor. Immediate surgery and chemotherapy were required to save his life. Armstrong had an orchiectomy to remove his diseased testicle. After his surgery his doctor admitted that he had had less than a 40% survival chance. The standard chemotherapeutic regimen for the treatment of this type of cancer is a cocktail of the drugs BEP (bleomycin, etoposide, and cisplatin (or Platinol)). Armstrong, however, chose an alternative, VIP (etoposide, ifosfamide, and cisplatin), to avoid the lung toxicity associated with the drug bleomycin. This decision may have saved his cycling career. His primary treatment was received at the Indiana University (IU), Indianapolis, Medical Center, where Dr. Lawrence Einhorn had pioneered the use of cisplatinum to treat testicular cancer. His primary oncologist there was Dr. Craig Nichols. Also at IU, his brain tumors were surgically removed and found to be necrotic (dead). 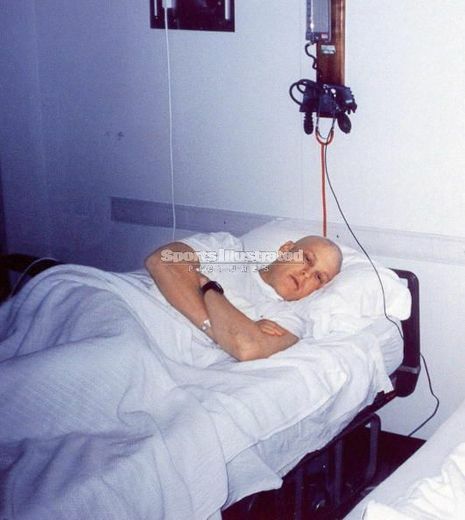 His last chemotherapy treatment was received on December 13, 1996. His cancer went into complete remission, and by January 1998 he was already engaged in serious training for racing, moving to Europe to race for the U.S. Postal team. A pivotal week (April, 1998) in his comeback was one he spent training in the very challenging Appalachian terrain around Boone, North Carolina, with his racing friend Bob Roll. On October, 2, 1996, it was discovered that Lance had advanced testicular cancer that had spread to his brain and lungs. The cancer was spreading rapidly and Lance went to emergency surgery to remove the tumors. The doctors got the cancer just in time to save Lance’s life. After aggressive chemotherapy, all the cancer was killed. After months of recuperation, it was apparent that Lance would not only survive, but be able to function as a physically-active person. After contemplating what kind of life he should lead, he decided that a return to racing would signify that he had beat the cancer. Upon returning to peloton, Lance searched for another goal. Through consultations with friends, coaches and other athletes, he decided that a return to the Tour de France would be his next goal. Before the cancer, Lance was a powerful rider who had a build more similar to an American football player than a bicycle racer. After the cancer, however, his body dropped most of its muscle mass. Through training, Armstrong further streamlined his body and rebuilt himself into a Tour de France contender. His weight after the rebuild was 15 pounds (7 kg) less than his racing weight prior to the cancer. The muscles in Lance’s upper body didn’t get rebuilt to the same level as before. This allowed Lance to ride the high mountains with the climbing specialists. Lance was always a good time-trialer, but after the rebuilding, he was even better. On top of that, he had already suffered more physical pain than most people could ever dream of. In short, he was now prepared to win the Tour de France.